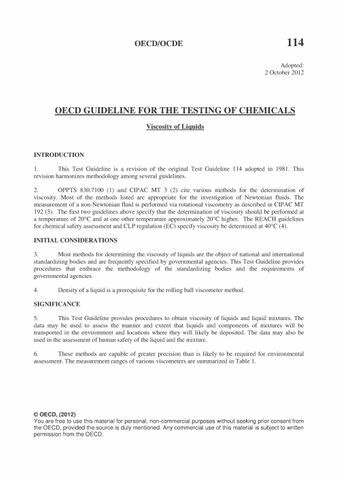 This Test Guideline describes methods to measure the viscosity of liquids. Most of the methods listed are appropriate for the investigation of Newtonian liquids. The measurement of non-Newtonian liquids is possible with the rotational viscometer. Viscosity measurements are carried out according to five methods: the capillary viscometer, the flow cup, the rotational viscometer, the rolling ball viscometer and the drawing ball viscometer. Each determination of viscosity should be made at a temperature of 20°C and at 40°C. At least two determinations should be made at each temperature. The viscosity measurement is to be carried out according to the standards in the case of capillary and forced ball viscometers. In the case of rotational viscometers, the specification of a viscosity is appropriate only for Newtonian fluids. For non- Newtonian fluids, the results obtained are preferred in table or graph form, preferably in the order of increasing shear rate.